I’m supposed to be doing recipes from the Thermomix book for the first week. This is a book that has recipes for apricot chicken and beef stroganoff. It’s a very patchy publication. So I’m not in the mood. But I’m picking stuff up, like how to start off a soup. You chuck in a halved small onion. A smashed clove of garlic. Zap for ten seconds on speed seven. It won’t pulverise them, it will chop them up fairly severely. Put in a slice of butter. Mix for two minutes on hundred degrees on speed one. It just gets them to translucent. We need a verb for “put in Thermomix and add some settings”. I’ll ponder that for a bit. Put in two tomatoes, cut in half. Cut in half four zucchinis that some kind person bought for you in the mistaken belief that they were cucumbers. Add them to the pot. Zap for ten seconds on speed seven. 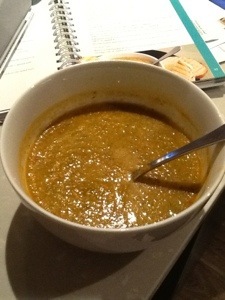 Add in a cup of frozen chicken stock and a tablespoon of that ultra salty Thermomix vegetable stock. I can’t bring myself to throw it out, so I may as well use tiny bits of it here and there. It can’t go in the compost, it would kill it. I was going to put in cauliflower, but I forgot. You could put in any vegetables really. Cook for twenty minutes at 100 degrees on speed one, which just moves it around. I put the steamer basket over the hole in the lid because I thought it could do with being reduced a bit. It sounds cringingly healthy, but it was surprisingly tasty and satisfying. I didn’t even put cheese in it. It had a bit of body to it. It made enough for two, so I’ll have it with toast for lunch tomorrow. I may have to follow it up with a chocolate bar, but at least I’m getting my lycopenes.